Can’t wait to hit the slopes? Do you want to hire a ski instructor or teach yourself on the best skiing techniques? Whichever route you take one thing for sure is that you will need the right skiing equipment. Equip yourself with the most amazing skis of the year and your entire family will enjoy the weekend on the steep slopes. When you go ski shopping, it’s very vital that you consider your expertise level. 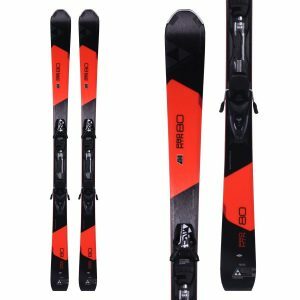 The height and weight of the rider is also an important factor to take into consideration in choosing an appropriate ski. 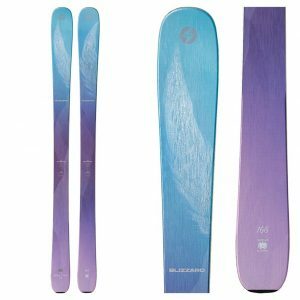 Considering all these aspects, we filtered the best women’s all mountain skis and chose our top five products. These are for beginner, intermediate and professional skiers. 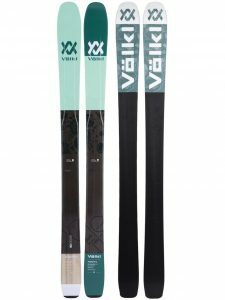 Volk 90 eight designs is an improved ski, versatility wise thanks to its glass layup. The skis lightweight and the 3D construction; mean that you will be able to lay down the trenches at very high speeds. The tip and tail rocker allow for a stiff flex setup causing the ski to turn very easily. The sole and tail zones are flexible while the middle has some of the traditional cambering for propping the ski. The 3D construction ridge also increases the ski’s agility. The ridge is constructed in a manner that it bevels out to a thin edge in the front and rear reducing the inertia mass on the perimeter. The Volk 90Eight features a multilayer wood core with woods of different densities. A Poplar core is used the most on the ski while a dense ash core is utilized in the binding attachment area. The ash core allows for greater retention of screws and prevents binding pull out while the poplar sections allow for resilience and easier snap while skiing. For the intermediate and advanced female skier who is not afraid to adventure off-piste from time to time, the Blizzard Black is the product for them. The Blizzard Black Pearl is easy to maneuver yet very solid underfoot during rough terrain. The Carbon flip core construction of the ski makes it stable and energetic thereby suitable for any part of the mountain. The snowy conditions on the slope will not be able to stop you thanks to the poplar beech core when you hit top speeds. In order to enhance rigidity and retention under the foot, the Blizzard Black Pearl 88 uses, a Ti Binding interface. 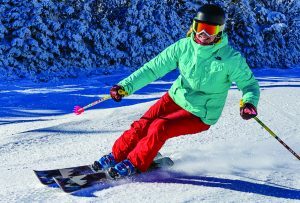 Female skiers are a bit different from male skiers, and Blizzard Black manufacturers are aware of this. The company incorporated a sandwich compound sidewall construction that makes it easier for ladies worried about edge hold in firmer conditions. The Blizzard Black Pearl 88 is a tried and tested ski of choice for many women; it’s up to you to try to find out why many female skiers are stuck on it! The Pandora 95 brings an edge-to-edge feel and versatile footprint on board women skis. 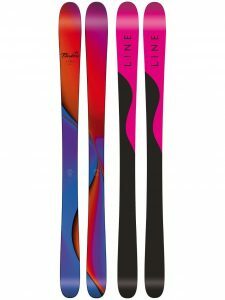 Its fluid rocker and Mapelite core construction make the LINE Pandora 85 the best all mountain skis. The versatility of the ski extends off-piste. The ski is capable of taking on all terrains are conditions with ease. Fast and turny ski, the Pandora 95 will bash through bumps as if they never existed. You won’t even realize that you hit a bump when skiing. The stability and security offered by this ski allow the user to concentrate on developing her skill and improve off-piste skiing. On-piste. the Pandora 95 still manages to do well. Its short radius and lightweight nature allow for impressive responsiveness allowing you to turn with ease. Pandora 95 has a great edge hold that enhances the users control on-piste as well. This permits easy, enjoyable turns in any conditions. 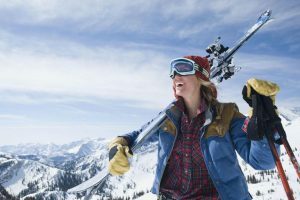 While skiers of any ability can use the ski, advanced women skiers are the ones who would benefit the most from this fantastic versatile ski. 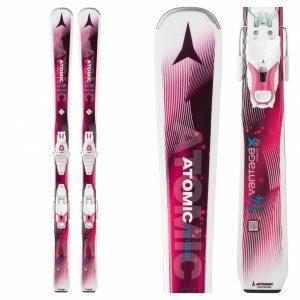 A confidence-boosting ski for beginner and intermediate skiers the Atomic Vantage X 74 is crafted out of a forgiving Densolite core. This ski is perfect for the teenager who is ready to test her first pair of adult skis. The Densolite core makes it very easy for new skiers to learn and progress their skill to the next level, as it is very lightweight and forgiving. The Exo-profile also contributes by allowing easy control and steering thanks to its 3D shape that lowers the swing weight of the ski. The all-mountain rocker embedded also guarantees performance anywhere in any snow conditions. Looking at the sidewalls of the Atomic Vantage, they are featured with full blocks allowing for 100% transmission and a solid edge grip. The Firewall sidewalls also absorb vibrations providing the novice skier with a vibration less ride down the mountain. The rocker together with camber underfoot will hold the skier in place and give stability as you improve on your turns every day on the mountains. The edges of the Atomic Vantage X 74 are made out of hardened steel giving great durability and unparalleled edge grip. The Fischer My Mtn 80 can be described as a forgiving, stiff all mountain ski that was designed for a capable, aggressive female skier. This ski is power-driven, the more power you input, the more output you get. The ski is great for charging across all areas of the mountain ensuring superb stability and control in various terrains. The rockered tips allow for excellent floatation across powder and enhance precision on-piste. The Fischer My Mtn 80 brings an incredible combination that is perfect for women who like to spend most of their time on-piste but would occasionally go off. The ski has a short contact length allowing for initiating turns that require little effort for the skier. In addition to saving weight, the beveled shape of the sidewalls, give the ski a unique look. The ski employs an Air Tec Core that reduces the weight of a wood core by 25% but still manages to retain its bending and torsional stability. This ski requires a lot of power to drive as low power can make it somewhat difficult to control. Overall, the Fischer My Mtn 80 is an aggressive, powerful ski that can charge all-round the mountain. If you are looking for a more versatile gentle ski, however, the Pandora 95 above might be a great alternative for you. Female buyers would feel very discouraged buying a ski due to the many varieties out there. On the contrary, it’s easy to purchase the right skis if you know what you’re looking for. Finding a ski that matches your skill and skiing type should be very simple. Here are a few tips on how you can get yourself the best ski. 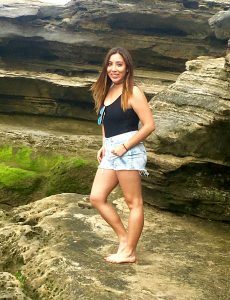 Before you begin your purchasing escapade try and determine your skill level. Unfortunately, there is no one women ski that fits all, so this is a decision you cannot avoid. At the same time choosing a ski that is below or above your skill level will delay your fun and progress in the sport. Beginner to intermediate women skis are normally short and very easy to turn. They require less effort to turn and are forgiving of any small mistakes made. Advanced to expert skiers need stiff skis. These require more technique to turn, as light skis begin to chatter at high speeds. There are six different skill levels ranging from beginner, advanced beginner, intermediate, advanced intermediate, advanced and lastly expert level. Be honest with yourself and pick the correct level, do not underestimate or overestimate your abilities. This refers to how short or long a turn a ski is designed to make. The turning radius of all skis is measured in meters and is a result of the skis length, shape, length, and width. A shorter ski creates a short turning radius as opposed to a longer ski. Same concept applies to cars where a short sports car is able to turn in tight circles while a long vehicle would require a wider circle. Some women skis come with bindings attached while some do not. These are said to have integrated bindings. So what are the advantages of integrated bindings? A ski needs to flex into an arch shape in order to turn on an edge. A ski that quickly gets into that shape is able to turn faster than one that has difficulties arching. Traditional flat skis require that bindings be screwed into the women’s ski creating a dead zone where the ski cannot flex. Conversely, integrated bindings sit on a track system that is then mounted on the body of the ski. As a result, skis with integrated bindings can still flex under the boot allowing them to arch effortlessly. There are some disadvantages that come with bindings nonetheless. The bindings installed usually affect powder and twin tip skis. This is why you will find that powder and twin tip skis do not have bindings allowing the skier to decide on whether they want the recommended mounting point or a different one. Before we enlist the different types of skis, it’s good to know the difference between men and women skis other than their graphical designs. Manufactures take into account women’s weight, foot size, and strength when designing their skis. This results in skis that make the skiing exercise easy and more fun for women. All- Mountain: Most women fall into this category. These types of skis are designed to ski in any snow conditions in any speed. Twin tips: these have turned up tips and tails. These were originally designed for skilled skiers who wanted the comfort of landing facing any direction. These take an all mountain perspective nowadays and can perform both on the slope and in the terrain park. Powder: women powder skis have a wider underfoot than normal skis as they are tailored for use in deep snowy conditions. The extra width allows them to stay afloat rather than sink in below. Powder skis do not turn very well and are reserved for snow prevalent areas like Colorado or Utah. Racing: Racing skis are way stiff and narrow than normal skis and are designed to run at very high speeds. Do consider your size, weight, and height when purchasing the ski, and do not be afraid to ask questions. You are better off looking like a beginner rather than landing a wrong ski. Purchasing the wrong skis will make your skiing experience very unpleasant. Equally important have the company of a friend or an experienced skier when purchasing a women’s ski. This will help you get the most appropriate ski considering factors such as skill level, turning radius, integrated bindings and even color from a third party’s perspective. Furthermore, it is always good and advisable to try them on before you purchase. This will give you the confidence of acquiring the right gear that coincides with your ability.